Alexander Welch is an American college student that has been granted a six-month permit to study biology in Iceland. He is assigned to a Reykjavík-based research team that is investigating vitamin deficiency in local sheep. While carrying out his task, which among other things includes the collection of blood samples from various farms around Iceland in company of Snorri, a veterinarian with unpredictable behavior, Alex finds himself stuck in an unexpectedly intricate situation. Is Snorri into some illicit business? Is he in cahoots with a sordid bunch of slaughterers? When he finally gets to the bottom of the mystery, Alex has to cut his stay short for reasons that are well beyond his control. For the most part, the book is a retrospective narration of the main character’s stay in Iceland. The events Alex Welch recounts are encased between the months of August and October 2001: over this period, Alex has occasion to get acquainted with a variegated collection of people from all walks of life, to witness 9/11 from abroad, and to catch sight of Iceland’s multiple faces, from the loud and carefree facade of student life to the well-hidden practices of unethical work, which are finally the cause of his return. The Odd Saga‘s general time frame is accurate, even though specific events do not have an exact placement on a timeline. As the narration of Alex becomes foggy, we perceive his descent into loneliness and bewilderment. Like Alex himself, The Odd Saga‘s characters are depicted as believable individuals; all of them have distinctive traits that will make them remembered, even when their actions are quite limited in terms of allotted space. Some of them, like the shady workers of the slaughterhouse, are just sketches against the plot’s background; nevertheless, through a few remarkable features, they are vividly described and they manage to enrich the story. Females are the only exception, as their role is relegated to cracks and interstices in men’s actions and speech. They are figures filling the gaps or moving about behind the scenes, uttering a few convenient lines now and then, only when inevitable. The author affirms his intention was to deliver a story that was as close as possible to his own observation, and he experienced Iceland mostly through male figures, those that eventually offered the basis for The Odd Saga‘s primary characters. Interestingly though, it must be said that one female is the pivot around which the whole story revolves. Even if she is never seen, her presence casts a long shadow on each and every page. The main flaw that I find in this book is the abundance of stereotypes — Laxness as a common topic of conversation, the ubiquitous Brennivín, the vague description of Reykjavík’s hectic night life, drenched in alcohol and populated by legendary golden-haired women, and so on — that feel directly taken from a tourist brochure. These elements are recurrent in The Odd Saga, as they are in most books and movies set nowadays in Iceland. Honestly, I felt in many instances these details were superfluous and thrown in just so that the reader could easily get into the “authentic” Icelandic atmosphere. However, trying to evoke authenticity at all costs often results in the opposite: assuming these ready-to-use exoticisms are needed to convey the feeling of the place is a bit like assuming it is necessary to include references to pasta and Michelangelo in all books written about Italy or geisha and Osamu Tezuka in those written about Japan. Anyway, the concept at the core of EE Ryan’s short story is original enough to make up for these few weaknesses. The novella feels overall very cohesive and the story is tightly written. The author cleverly refrains from adopting useless flourishes to show off or from straying for too long from the narration just for the sake of it, successfully keeping the reader’s attention focused on the characters’ motivations and dealings. The descriptions are in many cases concise enough, but they still manage to convey a mood. What I stated above when referring to the characters is valid for the book as a whole. EE Ryan does not waste our time brooding with persistent angst over feelings and occurrences. He speaks of displacement and loneliness, but most of the times with irony. Even in the darkest moments, bitterness and vexation are mitigated by a sensible dose of jest. Above all, The Odd Saga is a piece of honest storytelling. With it, EE Ryan demonstrates to be a keen observer of people: he follows them as they establish — or fail to do so — mutual relationships, as they reel off platitudes around a table, as they try to conceal their embarrassing ineptitude or as they display warmth and generosity. Particular attention is given to dialogue, with frequent shifts in the language chosen. Remarkably funny is the convoluted English of Icelanders, dotted with ludicrous pearls of wisdom and inane “common sense”. 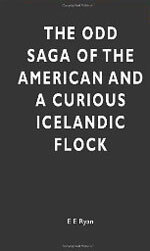 The Odd Saga of the American and a Curious Icelandic Flock is available on Amazon. Stereotypes and topics are present not only in books and movies by foreigners about Iceland, but even in books and films about Iceland by icelanders, they are present even in the most succesful icelandic music abroad. Iceland is a place with strong common places rooted in the expectations of foreigners, and the most comfortable atitude among artists is to fullfil the expectations of tourists, and also the easiest way to make money abroad with your books, films and music. Actually, Iceland is a la mode,and you can find a lot of writers in english, french,german,and even in spanish writing books about Iceland or with something icelandic in her plots: volcanoes,ashes,wild nature,elfs,trolls witches,nightlife…not the clean look of a stranger about another country and culture. An example: Olafur Arnalds, in a recent concert in Barcelona,spoke about one of his songs, a beautiful one, I cant remember the title,telling to the public that this song was originally composed for a tv commercial about showers, jacuzzis or something like that. Well, all the comments in his web about this song were about magnificent landscapes, stunning waterfalls,the midnight sun and so on. Haha… best Iceland-related quote of the year, so far.